Heathcrest specialise in the repair and general maintenance of commercial and industrial heating & hot water systems throughout the South of England, South Midlands and East Anglia. 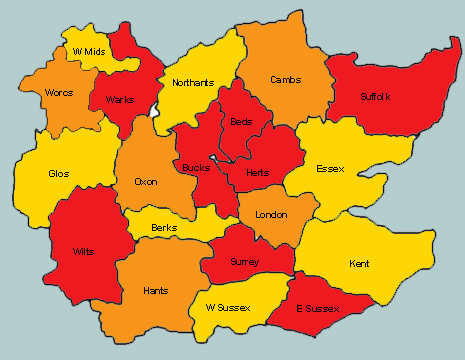 If your business falls anywhere within the area shown in the map above, we can help you. Our offices are based in the pretty village of Hyde Heath in Buckinghamshire, though our clients can be found throughout the South Midlands, London and South and Eastern Counties of England. Service engineers are just a phone call away and we offer a rapid emergency boiler repair service, throughout Buckinghamshire, Oxfordshire, Hertfordshire, Berkshire, Bedfordshire, Oxfordshire, Surrey and West & Central London. We are agents for Certikin swimming pool equipment and offer a comprehensive maintenance service for indoor and outdoor swimming pools. Although we specialise in Powrmatic and Stokvis boilers and heating products, we are also able to service and maintain almost all makes of equipment, up to and including quite ancient obsolete systems. For free estimates and free safety advice please contact us using the form on our contact page here.